I have to be honest, I didn't love the cover of this book, but the back cover piqued my interest so I thought I'd give it a try. I'm glad I did. I really like Bobbie's stubborn strength in this book. She does not give up easily, and that trait goes a long way in helping those around her. Searching for a home, she soon realizes that she needs God too. I loved how the Gospel is woven in and shared with Bobbie in such normal ways. Jace is a great leading man. Strong enough to stand up to Bobby and equally as stubborn, his matching personality sets a fun stage for their growing relationship. The adventure and suspense in this book was well paired with the romance, and I turned the last page satisfied with a smile on my face. 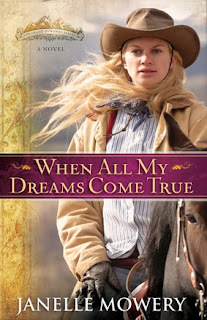 When All My Dreams Come True is the first in Janelle's Colorado Runaway Series, and I'll be sure to read the rest.